The Switch2 SMS management platform is a complete environment for managing your SMS services. 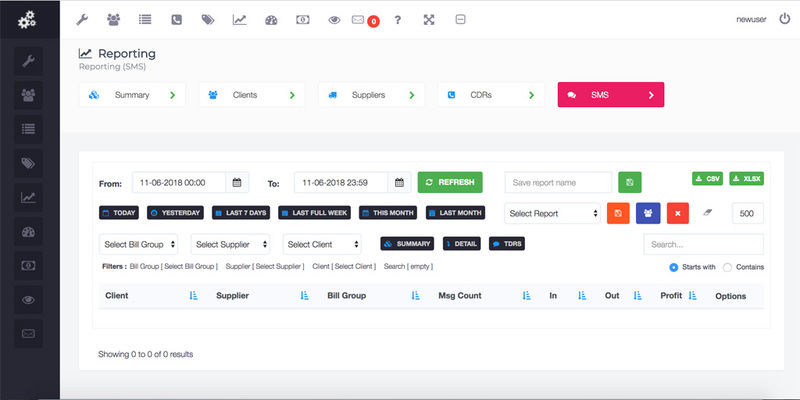 From setting up binds to routing sms and reporting, the platform provides an easy to use interface for quick access and control. All our platforms work in similar principles. User rights control what users can see and what they are allowed to do. All settings and service configurations are based around the client / supplier and route. Statistics are comprehensive and can be expanded in view, right down to the actual message. Reports can be stored, downloaded and automaically emailed. Global or client level pricing can be applied. Our SMS platform continues to evolve from client feedback and we constantly add features and services to enhance our systems. SMS services is a large scope service, please contact us to discuss your requirements. Bind's (sms connections) are easily configured and can be customised to meet the needs of your suppliers and clients. Messages can be terminated locally or routed onwards, in any protocol. Example: accept messages in SMPP and forward in HTTP. All reports are in realtime, no waiting ! Control message passage through your system, filter and block according to your own rules.